Gluten free chocolate lovers, rejoice! Our Gluten Free Double Chocolate chip cookie is chocolate heaven. Loads of semi-sweet chocolate chips baked into to a rich dark chocolate cookie made with rice flour. The best snack I have had in a long time. 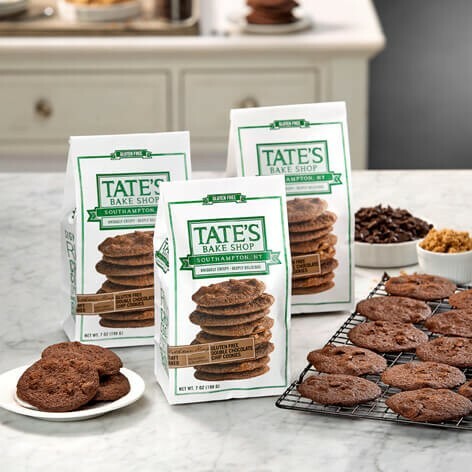 Really flavorful and doesn't have the aftertaste of most gluten free cookies. Enjoyed them a lot more than I thought. TRY THESE. I'm so serious. By far, one of the best gluten free cookies I've ever had. Crispy and buttery. I wish there were more per package, and that more stores sold them. They're definitely a keeper. Gluten Free Doesn't Have to Taste Like Gluten Free Anymore! 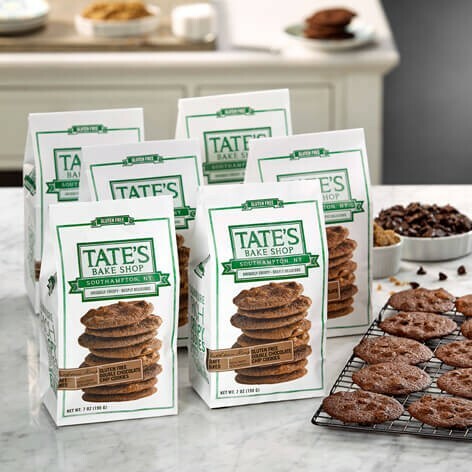 I was introduced to Tate's cookies when a friend brought them to to our knitting group. They looked so delicious but I said, "No thank you." when they were passed my way because I need to be gluten-free. My friend smiled and told me that they were, in fact, gluten free! I loved them and so did everyone else in the group! Fortunately, my local supermarket now sells these precious yummies and I can have them whenever I need a cookie fix. Thank you for making good...no, delicious cookies. How about expanding the line to include oatmeal cookies? Get you some of these! Delicious! Was very surprised and like Mandi, I ate my fair share very quickly, but could have easily eaten the whole bag! I was diagnosed GF last week. I had these cookies today. If this is suffering, bring it on! Lol. Hands down best cookie ever!! Cookies really aren't my favorite indulgence, but when a friend gave me one of these, I nearly ate the whole bag. I had absolutely no clue they were gluten free, which I think is really saying something. These have the right crunch and perfectly soft chips. I want to search out gluten free people to give these delights to. Delicious! Not the typical gluten free cookies that taste like sand. They are buttery, crisp & chocolatey. Yum!